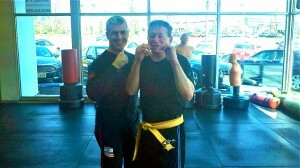 Frank Colucci: I would like you to meet Mr. Al Dragon (in yellow). Al was one of the students who took the 6 hour orange belt test yesterday…a grueling test by even the most conditioned person’s standards. Al didn’t skip a beat despite multiple rounds of full contact one-on-one sparring; two-on-one sparring and four-on-one sparring starting from his back on the ground. And now for the inspirational part….Al is 75 years old….That is correct, 75. So the next time that you are telling yourself that you can’t do this or you’re too old for that, remember this story…..And a big salute to Al, a great Kravist and a great man…..w/ Israeli Maga — with Albert Dragon. Al Dragon with David Kahn, Israeli Krav Maga Association’s U.S. Chief Instructor, author of books on Krav Maga; David trains local, state, and federal law enforcement agencies and military units including U.S. Marines Special Operations Command. David was featured in publications including Men’s Fitness, Men’s GQ, Penthouse, New Yorker, Daily News, New York Post, Los Angeles Times, USA Today.